Wellesley is undertaking an ambitious plan to reduce its environmental footprint and engage with its beautiful campus in new ways. 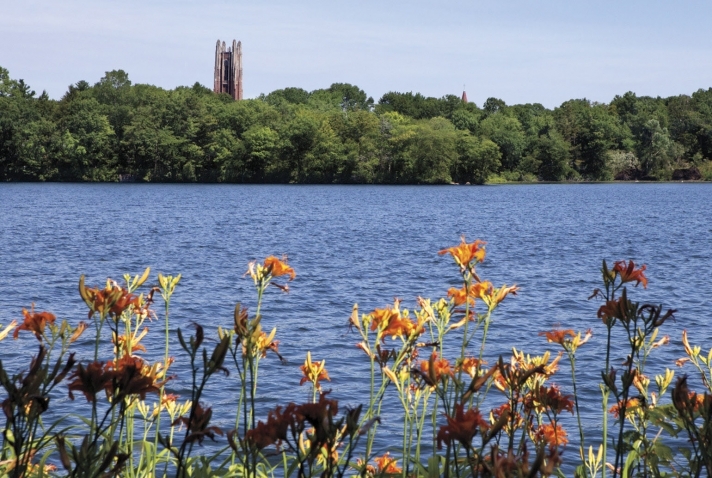 The stewardship of Lake Waban is central to the College’s commitment to sustainability and environmental awareness. 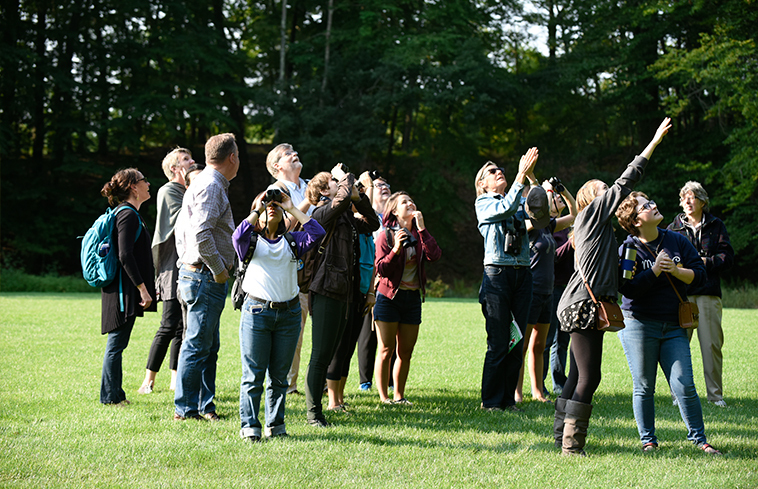 On Sept. 11, conservationist Wendy Judge Paulson ’69 went bird-watching with a gaggle of students, staff, and faculty members. They had a pretty good morning—during an hour’s ramble through Alumnae Valley and alongside Lake Waban, the group spotted some 24 species, including a yellow-rumped warbler, a pied-billed grebe, and a quarreling group of warbling vireos. In the tupelo trees along the winding paths, the watchers spied catbirds, cedar waxwings, and goldfinches. It was a perfect morning to be out in the landscape. It was not always so. Before 2005, a stroll through this area bordering Lake Waban on the west side of campus took the walker across a crumbling parking lot and past decaying tennis courts, all of which was on top of a brownfield of toxic soil. It’s easy to forget that what is today Alumnae Valley is a built environment, a wetland in which the landscape is configured so that water runoff flowing through it is cleansed before it reaches the lake. The ambitious restoration project earned a 2006 Award of Excellence by the American Society of Landscape Architects in a competition that included 500 international submissions. In the years since its completion, nature has so abundantly returned to Alumnae Valley that (along with bird-watching) a range of outdoor activities—including identifying plants, finding amphibians, and locating pollinators—was offered as part of the campuswide Sustainability Day on Sept. 11. The day inaugurated the College’s Year of Sustainability as well as the Wendy Judge Paulson ’69 Ecology of Place Initiative. During Sustainability Day on Sept. 11, Wendy Judge Paulson ’69 points out a bird to an attentive student. The 2017–18 Year of Sustainability is the brainchild of the Advisory Committee on Environmental Sustainability, a group of faculty, staff, and student representatives who worked with the College to create an ambitious, 10-year plan that stakes Wellesley’s future on sustainability and commits to a dramatic reduction of the College’s environmental footprint. 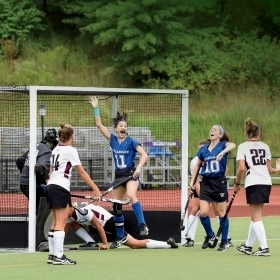 In April 2016, the Wellesley College Board of Trustees approved the plan. Reducing potable water consumption by 50 percent by 2026 (from a 1999 baseline—39 percent was already achieved between 1999 and 2014). Additional goals include phasing out plastic bags at campus retail operations, making sure that 90 percent of the office paper purchased by the College will have at least 30 percent post-consumer-recycled content, and providing support for faculty across all disciplines—not just the sciences—who want to integrate discussions of sustainability into their courses. 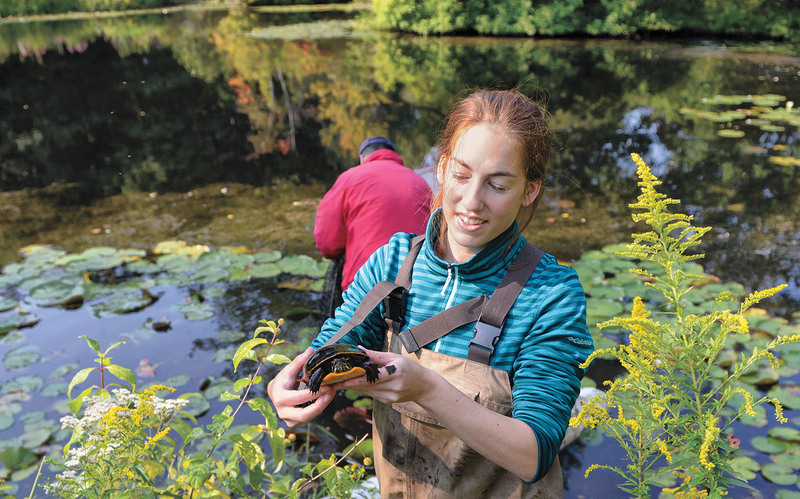 Academics: Increase hands-on learning and research opportunities in sustainability and expose incoming students to sustainability at Wellesley. Buildings: Address the backlog of deferred maintenance of buildings and their supporting infrastructure and establish protocols for each building for maximum energy efficiency. Climate and energy: Install solar arrays on campus that can supply 5 percent of the College’s electricity demand over the course of a year; meter 80 percent of buildings for electricity and other utilities and make the information available for management and decision-making. Food and dining: Create a better system for collecting more food-related data and information and increase sustainable food and utensil purchases. Landscape and watershed: Improve sustainability of water management, including storm water runoff, and increase metering, measurement, and environmental testing. Purchasing and waste: Undertake a systematic review of waste management on campus and report monthly statistics on volumes of waste and recycling, as well as increase the number of administrative offices taking part in a challenge to be sustainable. Transportation: Reduce single-occupant personal vehicle use for commuting from 80 percent to 60 percent of trips by 2020 and increase the efficiency of the Wellesley Motor Pool fleet with new purchases and replacements. Water: Pursue improvements to the campus’s already high-quality water supply, including the upgrade of the College’s aging water supply infrastructure, which is the source of taste complaints about campus water, and phase out the purchase of bottled water across campus. A yellow-rumped warbler, one of the species spotted by the bird-watchers. Throughout the 2017–18 academic year, sustainability and/or climate change will be a theme, imbuing the annual Douglas, Wilson, and Goldman lectures and monthly faculty talks in the Science Center. 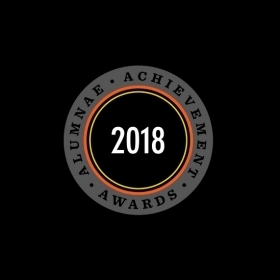 Invited speakers will include an advocate for zero-waste living; an expert in sustainable architecture; and an academic working at the intersection of biology and art. 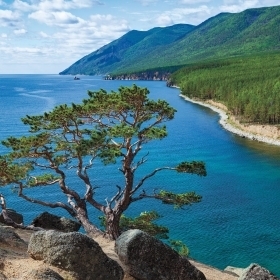 A philosophy colloquium will address moral and political issues concerning climate policy. A behavioral-change campaign will be run in student dorms by eco-reps who will encourage recycling and reduction of waste (see “Reppin’ for the Planet,”), and the sustainability committee will host a competition to encourage student engagement in sustainability-related projects on campus. In addition, the committee has provided faculty with tools, such as reading lists and websites, for integrating sustainability into their teaching, says Suzuki. 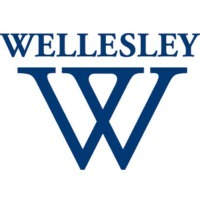 Chakraborty would like to see Wellesley, which last year was number 75 on the Sierra Club’s “Cool Schools” list, begin to climb up that assessment ladder. The annual list ranks colleges and universities on “green” measures that reflect the broader priorities of the Sierra Club—campus energy use, transportation, and fossil-fuel divestment. “If we all work together, I am sure that we will rank among the finest sustainable colleges in the nation,” he says. Helping to lead the charge is Rob Lamppa, who joined the College as director of energy and infrastructure and chief sustainability officer in October. An engineer by training, Lamppa brings broad experience in physical-plant operations and improving sustainability performance, honed in his role in sustainability operations at the 935-acre campus of the University of Wisconsin–Madison. “Energy use management—from the power plant to the buildings—is the key to reducing greenhouse gas emissions. Reducing GHG emissions is one of the key goals of the sustainability plan, and Rob’s experience and background will lead us in the right direction,” says Chakraborty. As a first-year, Leung became involved with EnAct, the newest student environmental organization, and serves on its executive board. “Our mission basically is to promote environmental action on campus. 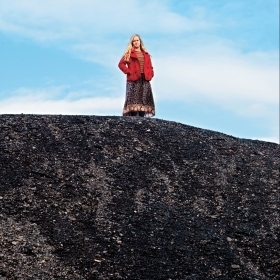 We’re interested in issues of food justice and engaging with the administration about environmental issues,” she says. Those working on sustainability at Wellesley see a connection between on-campus practices and broader environmental challenges. “Taking action here is consistent with our commitment to ‘minister unto,’” the Wellesley College Strategic Sustainability Plan states. In that spirit, running concurrently with the Year of Sustainability—and integrally linked to it—is the inaugural year of the Paulson Ecology of Place Initiative. This program, made possible by a generous gift from Wendy Judge Paulson ’69, seeks to use the beauty, diversity, and history of the landscape to teach environmental literacy and inspire environmental action. 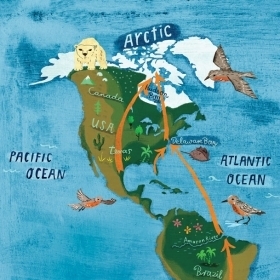 It will intentionally connect all Wellesley students to place, to the flora and fauna with which they share their four-year home and the natural rhythms of life outdoors. The initiative will include hands-on management of key ecosystems on campus, building a knowledge base through case studies. 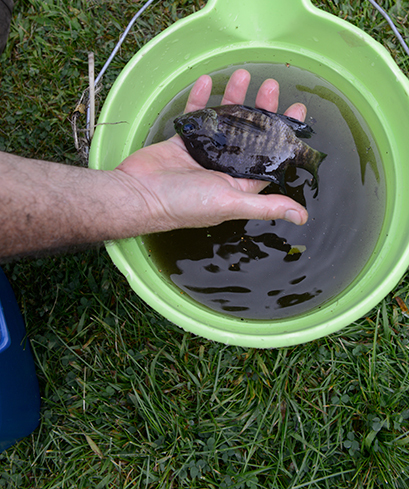 These efforts will enable students to get to know and understand the campus biological communities—such as Alumnae Valley, the Science Center meadows, Lake Waban/Paintshop Pond, Paramecium Pond, the Edible Ecosystem Teaching Garden, and the Bog Garden—by taking care of them. It will also involve activities in the arts and humanities, with writing classes using Wellesley’s setting as a journaling or poetic muse, dance performances inspired by the landscape, plein air painting, photography, and more. “We are the stewards of these spaces and the life that fills them,” Johnson said. Early-morning bird watchers spot some quarry in the trees on campus on Sustainablity Day, Sept. 11. The Ecology of Place Initiative encourages students to walk in the beauty of the campus landscape. 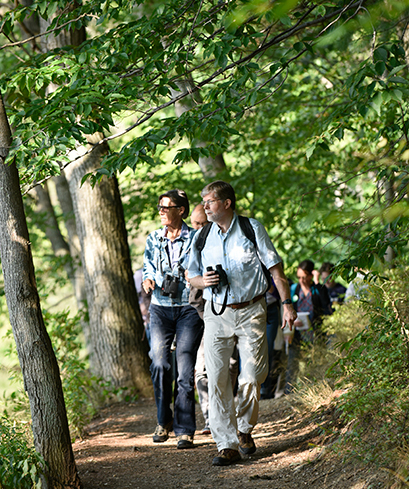 Nick Rodenhouse, emeritus professor of biological sciences, leads bird watchers, including Wendy Judge Paulson ’69, along a path near Lake Waban. 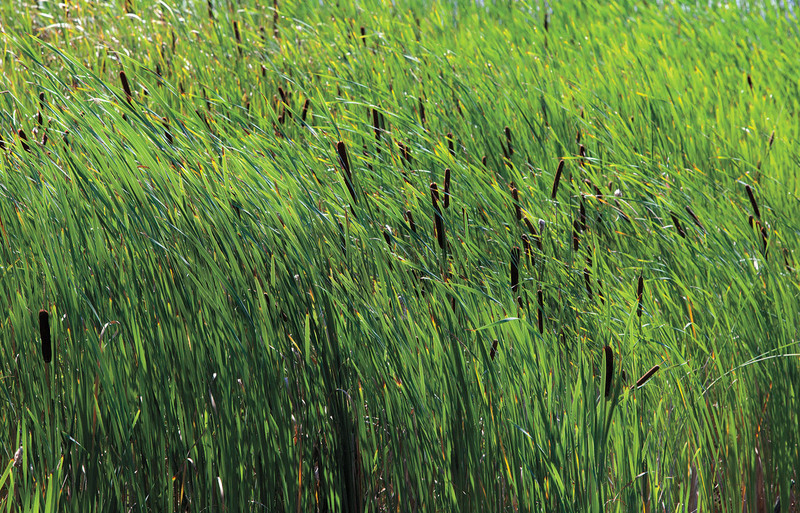 Reeds rustle in a pond in Alumnae Valley, a location that used to be a parking lot over a toxic brown field. Wellesley’s Sustainability Day included explorations of the amphibian and reptile life on campus—including this turtle. 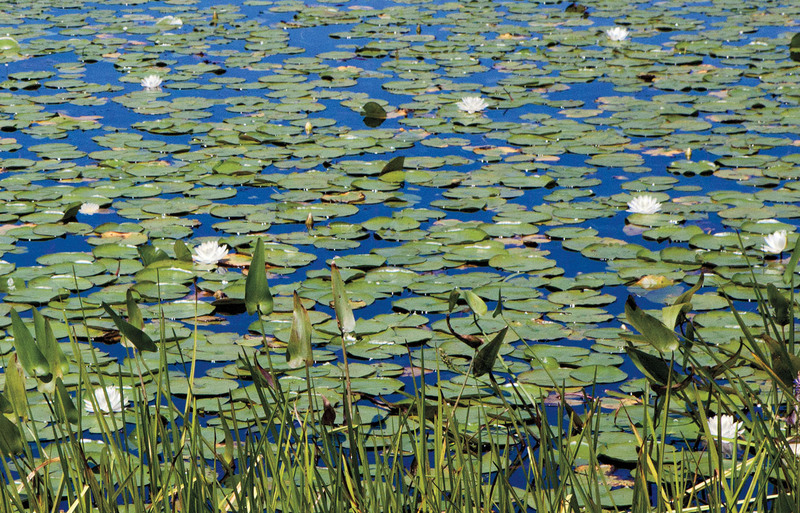 Water lilies cover the surface of Paramecium Pond. 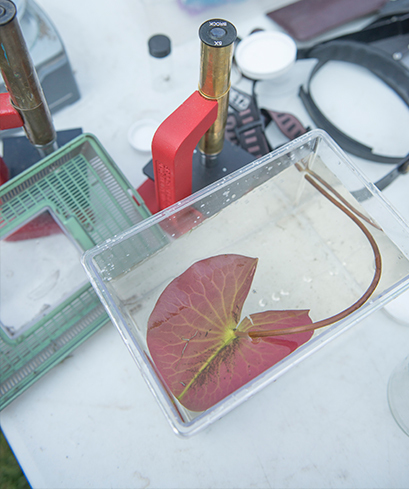 On Sept. 11, students were able to do fieldwork about the flora in Paramecium Pond, including examining this water-lily pad. 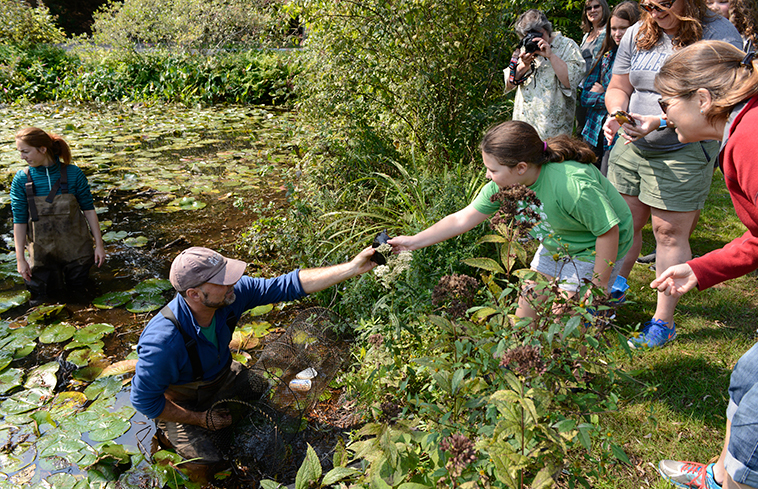 On Sustainability Day, students and Wellesley neighbors explored the plant and animal life in and around Paramecium Pond. A denizen of Paramecium Pond, temporarily out of its element. 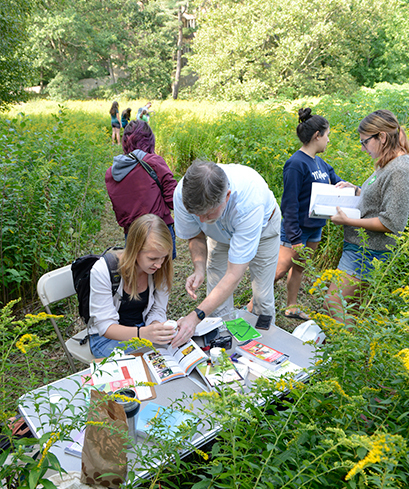 Prof. Nick Rodenhouse assists students with plant identifcation. 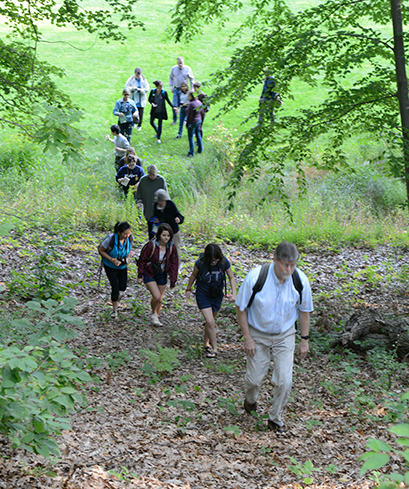 Prof. Nick Rodenhouse leads bird watchers up a wooded hill on the Wellesley campus. 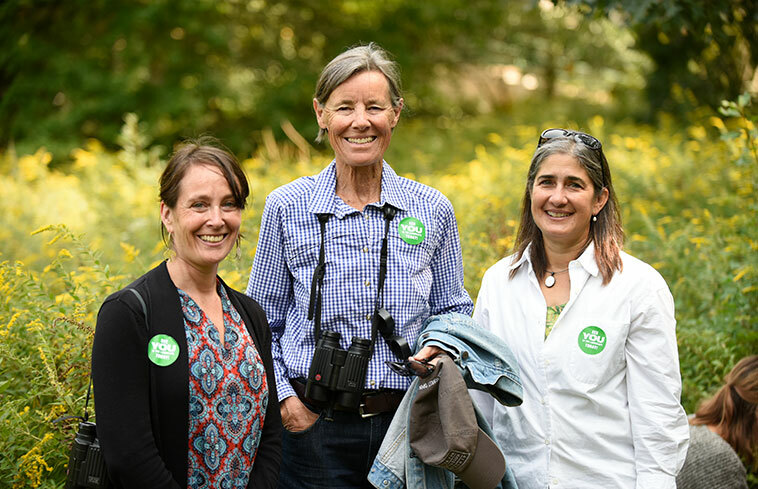 Suzanne Langridge, director of the Paulson Ecology of Place Initiative, Wendy Judge Paulson ’69, and Kristina Niovi Jones, director of the Botanical Gardens, enjoy the outdoors on Sustainability Day. 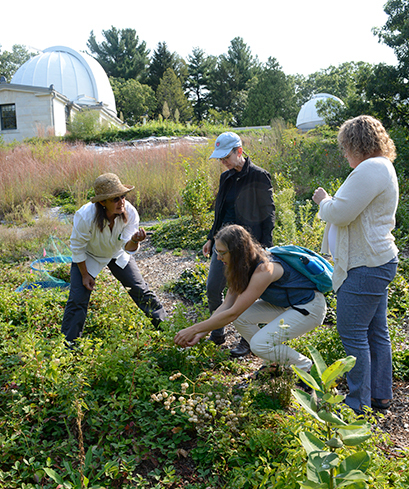 Students examine plants in the Edible Ecosystem garden as Kristina Niovi Jones, director of the Botanical Gardens, and Beth DeSombre, Camilla Chandler Frost Professor of Environmental Studies, look on. Spearheading the Paulson Ecology of Place Initiative is director Suzanne Langridge, who joined Wellesley this summer from the Stanford Woods Institute for the Environment at Stanford University. Not surprisingly, Langridge got the job. 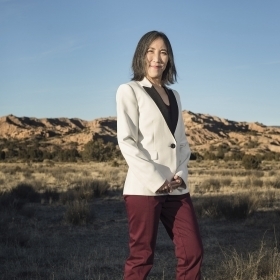 “I see ‘ecology of place’ as the intersection between nature and culture,” she says. “How do we bring those things together in a way that students can build an environmental ethic? Read more about the College’s sustainability plan here. Senior associate editor Catherine O’Neill Grace was thrilled to see a Baltimore Oriole one morning when she was walking through Alumnae Valley. As the Year of Sustainability gets underway, she’s making an effort to reduce her use of paper in the magazine office.